Urinary tract infections are extremely common in women of all ages and usually occur when bacteria such as E.Coli take up residence in your urinary system, which includes your bladder, urethra & kidneys. Conventional treatment for UTI's includes the use of nasty antibiotics such as methenamine hippurate, known to have serious side effects in some people. Apple cider vinegar is a completely natural and safe alternative to these dangerous and sometimes costly options. It can be easy to get confused when diagnosing a UTI as infections of the lower urinary tract (bladder and urethra) have different symptoms to those of the high urinary tract (kidneys and uterus). If left untreated for long enough, an infection that started with only minor symptoms can progress into something very serious indeed. If you are experiencing symptoms more serious than a little stinging, you should consult a Doctor ASAP! Abbreviated to ACV, it is a naturally fermented liquid that has been valued for its unique health benefits for thousands of years. Due to its potent anti-viral, anti-bacterial and anti-fungal properties, this natural health elixir has literally hundreds of health applications including the treatment of MILD Urinary Tract Infections. 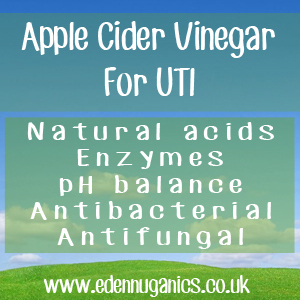 How can ACV help with a UTI? Apple cider vinegar contains natural acids (which are alkaline yielding in the body) that help to restore your body's proper pH balance. This is extremely important when treating urinary tract infections as problems are more likely to occur when your body is overly acidic or alkaline. Our bodies work best at a neutral pH of around 7 which can be achieved easily by regularly including ACV in your diet. As well as helping to balance your body's pH, the powerful anti-bacterial properties of ACV help it to wipe out bad bacteria lingering in our urinary tract in a matter of days. Add two or three tablespoons of apple cider vinegar to an 8 ounce glass. Using natural spring or mineral water, we now need to fill the glass, leaving a little room. The third step is to add some honey to the mixture. This is optional, but improves the taste. Drink this twice a day and you will be feeling the benefits in no time. If your infection has not cleared after a week it, could be a sign of a more serious condition and we recommend seeking the advice of a registered health care professional. What else can help with my UTI? Cranberry Juice - There have been a number of studies published that show pure cranberry juice is an effective preventative measure against UTI's. Just one glass a day is enough to dramatically reduce your risk of these infections. Baking soda - Adding a teaspoonful of baking soda to a glass of water is a great way to quickly reduce the pain associated with UTIs. The baking soda helps by neutralising the acidity of the urine. This will also help speed up recovery. More water - Drinking more water whilst suffering from a UTI will help in a number of ways. By passing more urine you are helping your body to flush out and remove the bad bacteria responsible for the infection. In addition the water helps to dilute the urine and stop acid levels becoming too high; the leading cause of UTI pain.